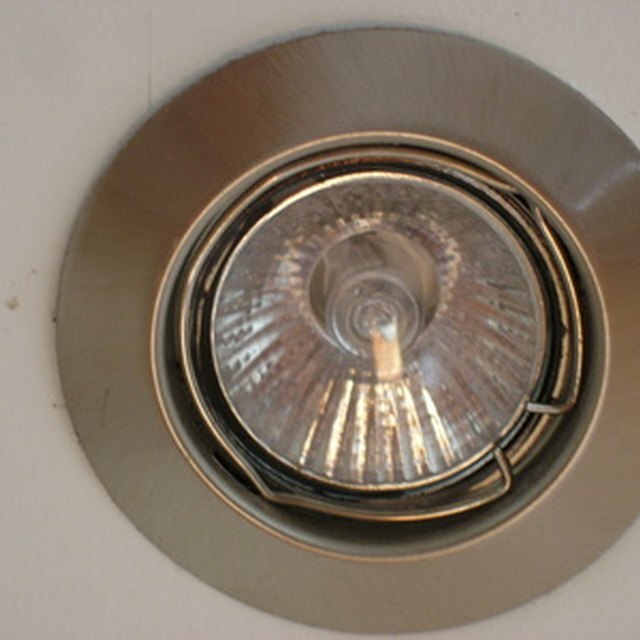 How do I Replace Recessed Lighting With LED Indoor Lights? An emerging trend in lighting technology is the increasing use of LED lighting. LEDs were invented in the early 1960s, and offer an environmentally friendly alternative to traditional incandescent light bulbs and the newer compact fluorescent light bulbs. LED lighting is often used in signage. As with all products, using LEDs has both advantages and disadvantages. LED is short for Light Emitting Diode, which is a semiconductor device that converts electricity into light. The diodes consist of a semiconductor encased in an epoxy lens, with an anode and a cathode protruding from the bottom which provides the connection point for the electrical charge. An LED diode measures about ¼ inch across. Early diodes were available in a limited range of colors. The first diodes were available in red only. Later technology created green and blue diodes, which would be placed in a cluster with a red diode to produce white light. Continued development has led to the LED range extending across the visible light spectrum into both ultraviolet and infrared wavelengths. Light Emitting Diodes produce light differently than an incandescent light bulb or a compact fluorescent light (CFL). Incandescent bulbs contain a metal filament which heats up when an electrical current is passed through it. The heat causes the filament to glow, which produces light. CFLs operate by using an electrical charge to excite mercury vapors sealed inside the glass bulb. When excited, the vapors glow, similar to a neon light. LEDs produce light by passing an electrical current through a semiconductor. As the electricity crosses the different components of the diode, the electrons in the current release photons, or light rays, and heat. As environmental awareness increases, along with concern over rising energy costs, the use of LED lighting has increased. One major factor is the efficiency of LED lighting, which converts almost 80 percent of the electrical current into light. Since incandescent bulbs work by heating an element that emits light, they are very inefficient by comparison, losing about 80 percent of their electricity to heat loss. LEDs can approach 100,000 hours of operational life, which is about 11 years long, compared with 5,000 hours for incandescent bulbs. LEDs are also used in a wide range of products, including signs, traffic lights, electronic devices and lighting in homes. Unlike CFLs, LED lights emit no toxic substances like mercury. Like anything else, LED lighting has disadvantages. The overriding disadvantage with LED lighting is the cost. LEDs are extremely expensive when compared to incandescent bulbs and even CFLs. LEDs tend to emit lower amounts of light compared to other types of bulbs, and the LEDs only emit life from the top half of the bulb, unlike incandescent bulbs and CFLs, which emit the light over a much wider area. The lack of heat emitted by LEDs is posing a problem for cities and towns in regions that receive snow; the LED traffic lights they have installed can become covered with snow, because the lights don't melt it. LED Lights: How Do LED Lights Work?